The UNE School of Social Work prepares students for advanced professional practice and is accredited to offer the Master of Social Work (MSW) degree by the Council on Social Work Education. 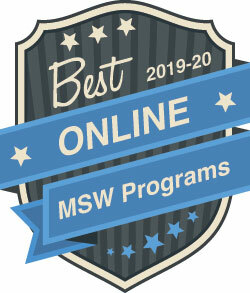 The UNE School of Social Work offers several online and on-campus options for those interested in getting their MSW degree. All options use the same curriculum taught by the School faculty. In addition to our regular 2-year, full-time program and part-time options, we feature an accelerated option that enables eligible students to obtain an MSW degree in a shorter timeframe. The MSW degree program prepares graduates to work with individuals, families, groups, organizations, and communities in an array of settings and with diverse populations. The values and commitments embedded in the School’s Mission Statement permeate our work in every area. 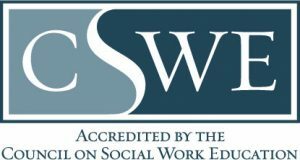 UNE’s online Master of Social Work program is accredited by the Council on Social Work Education (CSWE), which is recognized by the Council for Higher Education Accreditation as the sole accrediting agency for social work education in the U.S.
Promote social inclusion to enable people, populations, and communities to fully participate in society. Create person-centered collaborative and sustainable relationships across diverse communities and practice settings. Develop and apply ethical reflection, critical consciousness and shared decision-making based on social work values and with consideration of the broader contexts of the world in which we live. These goals are integrated into the social work curriculum. Through their presence in courses, field work internships, and internal School governance we bring our Mission Statement to life. The mission of the School of Social Work is to provide transformative and collaborative learning that embraces the values of social inclusion and promotes an enhanced quality of life for individuals and communities. We recognize that social exclusion prevents people from full and just participation in their communities as a consequence of inequities, discrimination, and disadvantage arising from adversity in early life and continuing across the life course. We practice social responsibility by raising public awareness of social exclusion, challenging discrimination and acting with and on behalf of groups, populations, and communities. We support person-centered collaborative practices and partnerships that bring together diverse workers and community members to meet the best interests of individuals, families, and groups.